Apple’s iTunes Festival has a new name, it will now be called the Apple Music Festival and it will take place in London in September. The 2015 Apple Music Festival will take place at the Roundhouse in London from the 19th to the 28th of September. 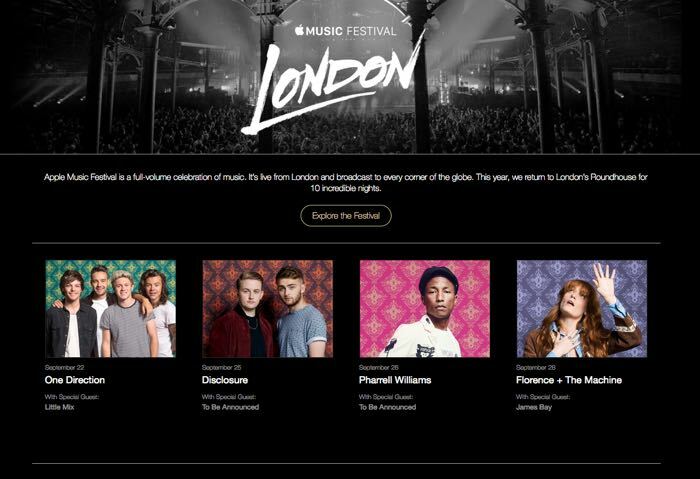 This years Apple Music Festival will feature performances from One Direction, Pharrell Williams, Florence + The Machine and Disclosure. You can find out details on how to get tickets for the 2015 Apple Music festival over at Apple’s website at the link below. The festival will also be streamed on Apple’s Beats 1 Radio which is available on Apple Music.